(Newser) – A man was injured north of Anchorage after a moose that he had just kicked stomped his foot in return, state officials said. KTVA-TV reported the man escaped with major injuries in the encounter Thursday with the moose and her calf, the AP reports. "It sounds like the moose were on a trail and in this case, it sounds like the guy was trying to go through them," State Department of Fish and Game spokesman Ken Marsh says. "That's never a good idea." The two moose left the area after the man had his foot stomped, says Alaska Troopers spokeswoman Megan Peters. "I am not a biologist, but as a lifelong Alaskan I would advise people not to go around kicking moose," Peters says. Moose have vast leg strength, Marsh said. "If you get into a kicking contest with a moose, guess who's going to win?" South-central Alaska has seen a number of violent incidents involving moose this spring, including a man who had a moose swipe at him with its hoof while feeding it and a cocker spaniel attacked by a moose in an Anchorage yard. Marsh says moose sightings are on the rise as females prepare for calving season in mid-May. 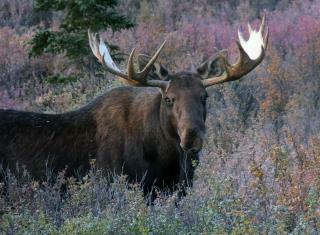 I've seen meese in AK and the baby is usually the size of a horse. The mom's head alone is the size of a small human. Kicking a moose is about as smart as poking a grizzly bear with a stick. Too bad it wasn't a horny male or we'd have a Darwin award and a much funnier story. Note to self: Stop kicking moose.